This remote uninhabited island is surrounded by crystal clear turquoise water, and white sand beaches. Pigeon Cay is just a few miles off the eastern tip of Roatan, and makes a great place to have a beach picnic, snorkel in the shallow water, or just relax in the cool water. Accessible by private boat, or float plane, a day-trip to Pigeon Cay can make a great addition to those vacationing on the island of Roatan. This image and many more can be licensed as stock photos here. 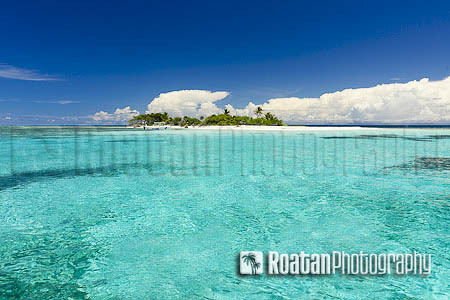 Roatan Photography also provides customized commercial photography to suit your advertising needs.